Dillon Waste is a family run waste management company based at The Kerries, Tralee, Co. Kerry. Garry Dillon, the company founder, has over 40 years experience in the waste management business. He constructed one of the first privately owned waste transfer and recycling centres in Ireland in 1994. Under the Waste Management Acts, 1996 – 2008, it was also the first privately owned transfer station issued with a waste permit licence. Dillon Waste has continued to grow and expand over the years with the completion of a €6 million development in the construction of the most up-to-date waste management facility in the region in 2010. Included onsite at our facility is a state of the art civic amenity centre which is open to the public from Monday to Saturday. In recognition of this valuable facility to the local community, Tralee Tidy Towns have presented awards to Dillon Waste in 2010 and 2012. Dillon Waste provide a range of waste management solutions for the catchment areas of Kerry, Cork, and Limerick, including kerbside collections and provision of various sized skips for commercial and domestic customers. On 5th October 2012, Dillon Waste won the Repak Recovery Operator of the Year 2012 award in the small to medium company category. The award was presented to Garry and Brian Dillon by Minister Phil Hogan, Minister for Environment, Community and Local Government. In 2013 & 2014, Dillon Waste were finalists in the Repak Recovery Operator of the Year small to medium company category. On 22nd October 2015, Dillon Waste won the top award in the ‘Waste Collection Operator of the Year Award’ for small to medium business category in The Pakman Awards run by Repak. 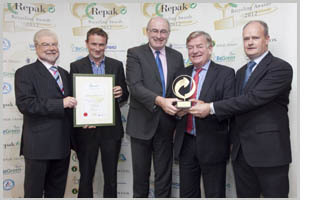 The Repak Excellence in Waste Management and Recycling award was presented to Garry, Brian and Garrett Dillon by Mr Alan Kelly, Minister for the Environment in the Shelbourne Hotel on Thursday night.